Creation or Evolution? Young earth or old earth? What should we teach our kids? 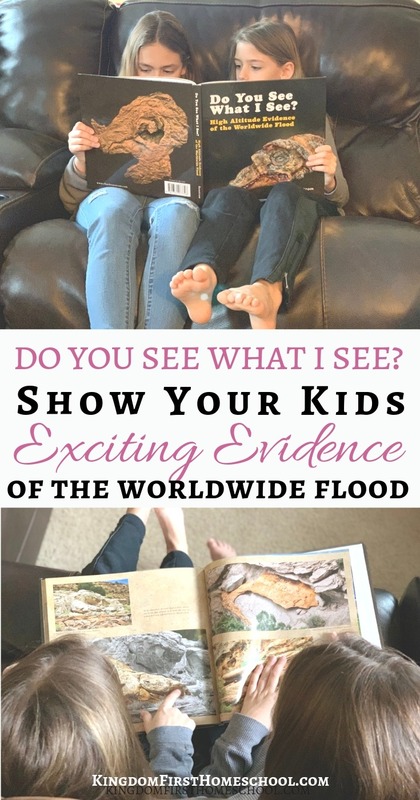 Findings in this picture book may show evidence of the Worldwide flood & furthermore, adding validity to Creation and Christianity as a whole. Whether you believe in Creation, Evolution, young earth, old earth or a worldwide flood, you cannot deny that there is a God! God is in everything, all around us. His handiwork is proof of a His existence. I love to point out all the little things that God does in our lives to my kids every chance I get. I was compensated for my time & given a copy of this book for my review. All thoughts and opinions are my own. Additionally my affiliate link is used within this post. See my full disclosure. All that is good, all that is pure, God created for us to enjoy because He is Good and He loves us. There are little reminders everyday all around us. How did we humans get here anyway? Were we created or did we just randomly evolve? Were we masterly crafted by God or are we merely the final result of countless cosmic accidents? I choose to believe that God is the author of Creation. God is the Creator and Sustainer of all things, both visible and invisible. He is infinite, eternal, and unfathomable, He reveals Himself to us through the universe He made and His infallible Word. We were purposefully and wonderfully made by God Himself, so when I heard about the photography book Do You See What I See? High Altitude Evidence of the Worldwide Flood, I just had to check it out! I’m so glad I did, because wow is it cool! God reveals Himself in many ways. He certainly revealed more evidence of Himself through Chuck Renstrom and his findings of Evidence of the Worldwide Flood. 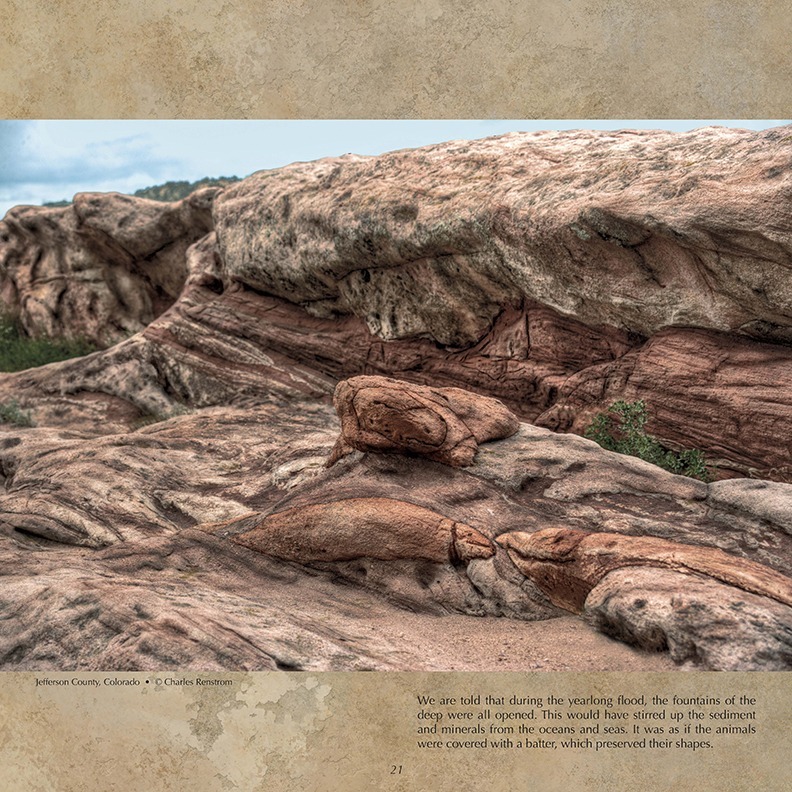 In this beautiful photography book you will see sea animals, and land creatures fossilized in the mountains and rock formations of Colorado. In this book you will see images of fossils from land and sea creatures. Chuck Renstrom’s book received a First Place Award from the Colorado Independent Publishers Association. He also speaks to Christian schools and service organizations. How did sea creatures get up to that altitude in the mountains? Were they catapulted out of the sea thousands of feet in the air? I think not! The fossils are found in Colorado’s three rock formations, including the White River, Green River, and Morrison Formations, which are known to hold lots of fossils. There are fossilized elephants, camels, mammoths, horses, rhinoceros, hippos, frogs, fish, beetles, scorpions, insect species, and over 100 tree species. 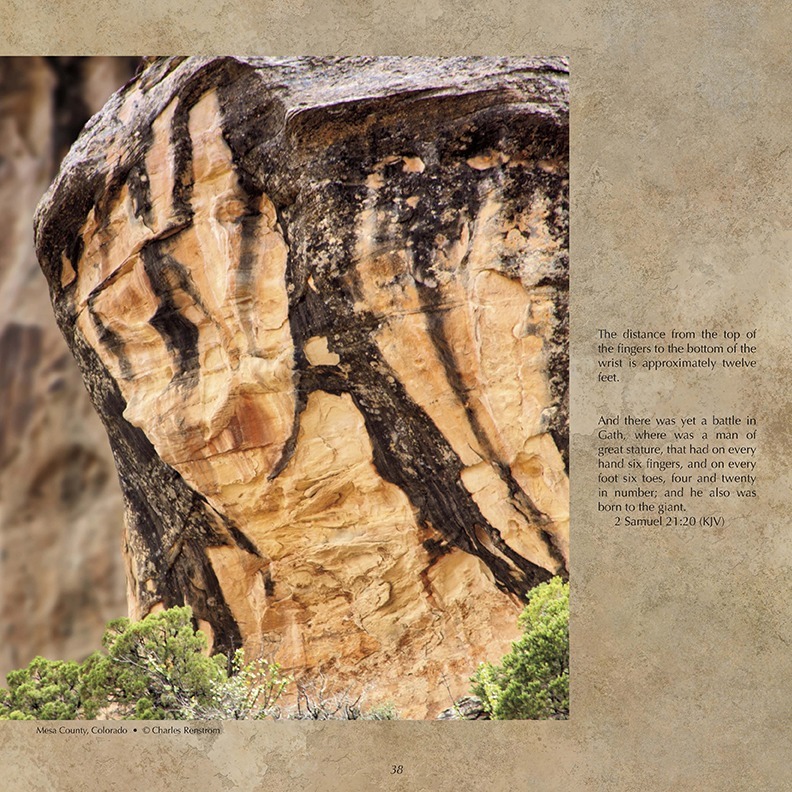 Chuck even found a 60 foot long worm (page 36,37) and a fossilized hand of a giant (pictured below page 38)! But what Chuck says is even more interesting is that the Morrison rock unit had fossils of dinosaurs, their bones, and their tracks. What kid wouldn’t want to see that? Chuck believes that all of these animals died during the great flood that is described in the Bible, the flood that washed upon the surface of the Earth during Noah’s day. From what He’s shown in these photographs I think it would be hard not to believe after seeing this. We still believe in the Word of God, it is truth cover to cover. So no matter what- The Flood in Genesis DID occur because it is in the Bible. The things of God will always be a mystery until we meet Him face to face, so you simply believe. Listen to Chuck talk about His book. 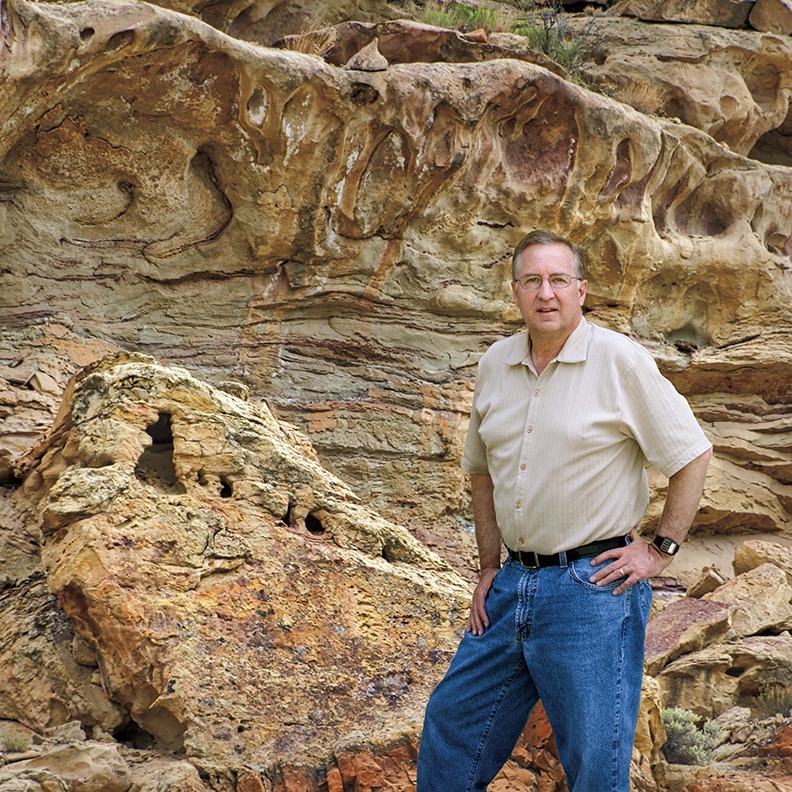 Glimpses of fossilized mysterious creatures such as dragons, dinosaurs, and even giants. Detailed thoughts from Chuck with Bible references included. Beautifully put together photography book. Kids will stare at these pages for hours studying these cool images. Spark great conversations and boost faith. 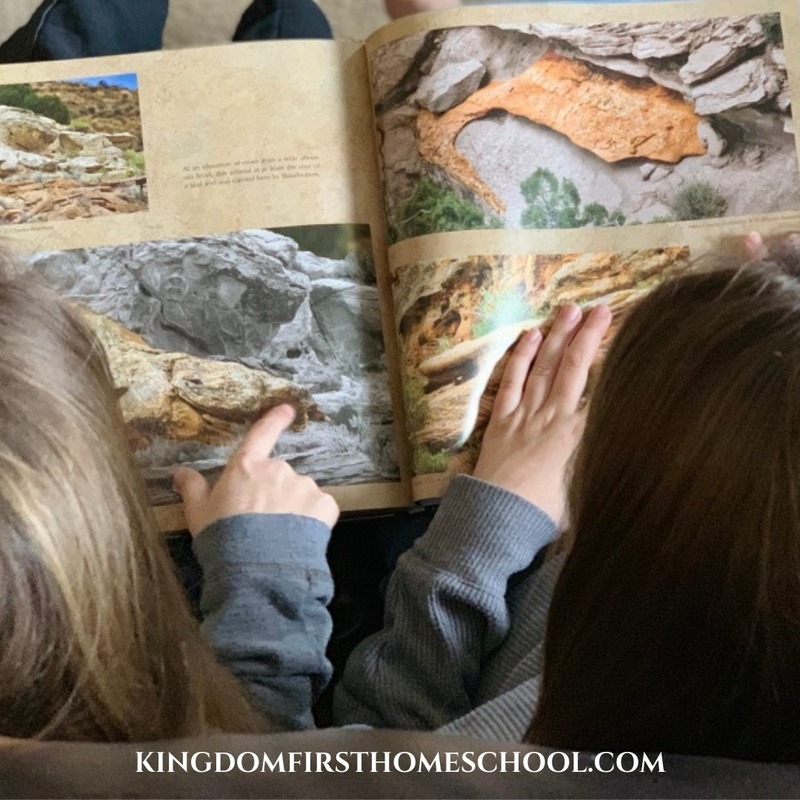 My girls and I were completely fascinated by this book! It’s one of those photography books that you can pick up time and time again and still find a new mysterious treasure. We reminisced about one of favorite stories of the Bible, The infamous worldwide flood. It sparked some great faith-filled conversations throughout the last few weeks and I’m sure it will continue to for months. If you’re interested in knowing more about this fascinating book head on over to ChuckRenstrom.com. You can also find it on Amazon!